Market report: More Buying Than Selling in Bullion Markets. In recent weeks J. Austin & Co has seen an uptick in gold and silver purchases. There is a slight squeeze in the market right now as demand is outweighing supply. Bitcoin buying and selling remains unchanged at this time. The Diamond market is starting to cool due to the increased popularity of lab-created stones. Those holding larger diamonds may wish to exit the market at this time. We have also seen a remarkable increase in larger estate transactions to the extent we have had to continually reduce our store hours in order to process the goods during these times of heavy market volatility. Such will be the case next week. The Grants Pass shop will be closed Sept 12th through the 14th to open again on Tuesday the September 18th. The Ashland shop will maintain normal hours during this time. If you are looking to move money into crypto currencies the easiest way is to sell to J. Austin & Co. Visit our Grants Pass shop for more details. 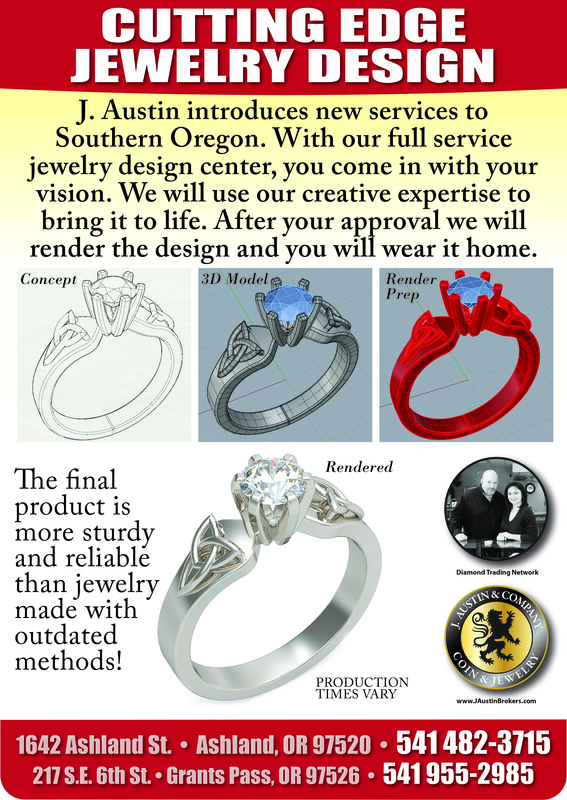 Think of a Jewelry Concept & We Can Make It! Silver investors in the last 5 years have seen a potential 450% return on investment. When silver hits bottom we may have a similar opportunity in the future. The real question is are we at the bottom? Many market analysts are saying the cost of production of silver is around $19 an ounce, if this is true, its possible this could be an excellent time to invest? How to prepare your coin collection for sale. J. Austin & Company buys coins and banknotes from around the world. Before you bring your collection in for an appraisal, do not alter, clean or try to change your coins or banknotes in any way. Cleaned coins and banknotes sell for less than those in original condition. Coins and notes are valued using different various criteria. Part of that criteria includes rarity & condition, coins that have been cleaned sell for lower premiums because the condition will be downgraded significantly. Every day we buy a large numbers of coins including half dollars as late as 1970, quarters and dimes from 1964 and earlier, wheat pennies, buffalo nickels and most coins that are 1933 and earlier. If you are in doubt, bring your collection in. We also specialize in key date and common date Morgan dollars as well as gold $20 double eagles. We buy U.S. bank notes (mostly from 1934 and earlier) as well as foreign collectible currency and coins. If you have a question about a coin collection or banknote collection call us at 541-488-4312. If you want to research the value of Morgan Silver Dollars, please visit this site: http://coins.about.com/library/US-coin-values/bl-US0100-Morgan-Dollars-Prices.htm you will achieve roughly 90% of the values mentioned here depending on the grade.